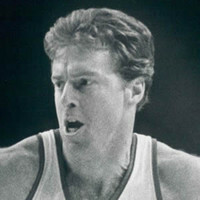 Dave Cowens was born in Newport, Kentucky, and played college basketball at Florida State. Many people believed him to be too small, at 6’9″, to play center in the pros, but in 1970 he was drafted by the Boston Celtics on the recommendation of the great Bill Russell, the start of a long and glorious career. In 1991, Cowens was inducted into the hall of fame. He made a brief foray into politics, running as a Republican for Secretary of the Commonwealth of Massachusetts.